Next Electrical is an Australian owned and operated business. We have been designing and installing Soundmask systems for many years. We are committed to finding the right solution for all our customers. With an electrical contracting background and trained technicians we offer excellent advice and will strive to find the best solution for our customers. We are specialists in difficult site installations. Programmed Electrical Technologies provides a multitude of services covering all aspects of audio visual, data communication, electrical and sustainability services to a diverse range of companies. No matter what your business size or industry type, you can trust us to design a solution specific for your requirements. Our highly skilled technical staff are at the forefront of new technologies and undergo regular training on every service we offer, from hardware and software to installation. Together, with our framework of a complete national service offering, we can confidently provide services able to give you best value. 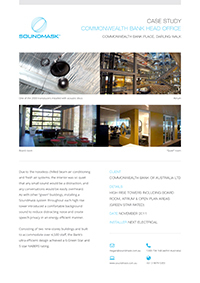 With international industry expertise, DRD is your one stop shop for Audio, Visual, Data and Technology solutions and products, both commercial and residential servicing a 30km radius from Brisbane CBD but further distances can be arranged on application. The Team at DRD collectively has many years’ experience in the AV and Technology industries and they are constantly updating their skills with new research and development techniques and technologies to deliver cutting edge systems. We are specialists in the design, integration and installation of customised AV and Technology systems. Faccenda Shopfitters is an Adelaide-based family business. We have been installing Soundmask systems with Soundmask Global for over a decade. We carry out retrofit and new building projects. We are experienced in all speech privacy and sound masking needs, including banks, open plan offices, large and small scale medical and counselling suites. We can design, manage and install projects ranging in size from one room to high rise multi-level buildings. 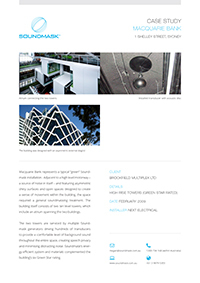 Brabham Electrical has been extensively involved in the supply, install & commissioning of sound masking systems in the Metropolitan and Regional areas of Western Australia. Being a family owned and operated company, Brabham Electrical keeps each and every project close to the heart, which guarantees a high quality service with the main goal being customer satisfaction. There is no job too small or too large for Brabham Electrical, from new builds to a single office fit out, each project comes with the same passion and eagerness as the last one. Domestic, Commercial and Industrial installations are all sectors we are very experienced in, we can design, manage, install and commission any speech privacy and Soundmask system to the highest degree. 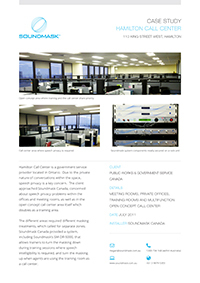 Soundmask Canada Ltd has been involved in vibration and acoustics for many years. Our knowledge of the market and experience in solving acoustic challeges has seen our market share grow. We are proud of our excellent customer service and the electrical and audio expertise of our team, which ensures that each project is designed and installed on budget and on time. Established in 1999, Mason Industries (Hong Kong) Limited is a vibration and noise control specialist serving the market of China, Hong Kong and Macau. Our head office is based in Hong Kong with branch offices in Shanghai. We specialise in vibration and acoustic solutions and are proud to supply our customers with a comprehensive range of the highest quality vibration and noise control products for industrial, architectural and transportation. Soundmask NZ Ltd has been supplying, designing and installing Soundmask systems for almost 20 years. We have our own in-house acoustician and our technicians have acoustic engineering qualifications and are well placed to solve your noise problems. With experience in all aspects of acoustic sound masking, you can rest assured that we can assist you in reaching a suitable solution regardless of the size or complexity of your project. Smart Systems has been installing Soundmask systems for many years. Smart Systems installers are trained to ensure the systems are correctly installed and meet code requirements. Mason East Inc was founded in 1995. With proven experience in acoustics, Mason East Inc has been involved in residential buildings including isolating the suspended ceilings in Trump Tower, high rise office buildings like the Cira Center, and large projects like the Yankee Stadium. We pride ourselves on our impeccable service, and strive to be considered the most service orientated representative to any of the companies that we supply. It is also our policy to quote every project in the territory, whether we are specified or not. By providing superior customer service our overall sales are based on 90% repeat business. Established in 1989, Soundmask Global is the leader in acoustic sound masking systems and the owner and operator of Soundmask. If you have an enquiry or would like to find out more about whether a Soundmask system is right for your project, please contact us. Click here to learn more about Soundmask Global's experience in developing and installing acoustic sound masking systems.